When I started into scroll saw projects as a beginner, I had no idea how I was going to go about working with the scroll saw patterns I had chosen. 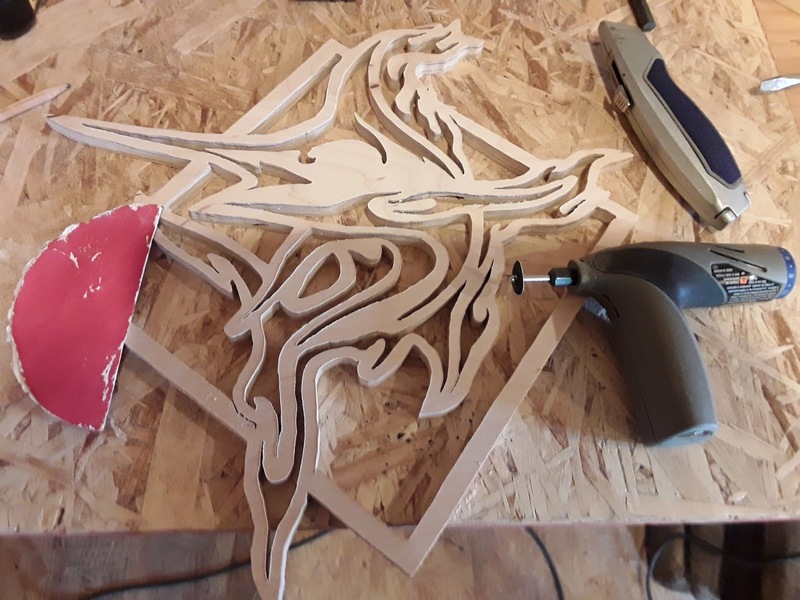 I definitely could have used some helpful tips in starting in on my first scroll saw patterns. Looking back on my beginnings in working on some of my first scroll saw patterns, I have come up with 5 tips for cutting out scroll saw patterns for beginners. When I was working on my first scroll saw pattern, I found that I needed a plan to get the pattern onto the wood. I also needed a plan for the cuts I was to make including those areas in the pattern where I could not do a continuous cut to. There was also some worry about how to keep safe from the scroll saw blade if my project was a smaller one as distance for my fingers from the scroll saw blade was important to me. After cutting out my first project I found that I needed to do some touch ups to the project to make things look a little better. Let me go into some more detail on these topics. How was I going to attach the pattern to the wood? I vividly remember this question when I was anticipating doing scroll saw patterns for the first time. I thought I would be clever and get some of that self adhesive paper you can print on. Apply that to the wood and I could get ready to start cutting. Well, that is just how it worked out, and it worked out fairly well, until… Trying to remove the paper did not work at all. As I tried to peel and pull that paper off my project, the paper seemed like it would be stuck on there permanently. I was lucky on that project as it was large enough I could sand off the paper pattern without damaging my work. I have heard people use painters tape, I have not thoroughly looked into this method, but to me it seemed like there should be some sort of better answer. I did find an answer and it came with the name Scroll Saw Tape which I purchased at Amazon. I bought a 20′ roll of this wonderful stuff, though I found that it might be the more expensive solution. You unroll some of the paper/tape, stick it to the wood you want to put your pattern on, and then remove the paper from the face up side. Lastly, stick your printed out scroll saw pattern to it. Once you are done cutting out your scroll saw pattern, it is fairly easy to peel off the pattern from your finished work. You may note, some scroll saw patterns if not most, have areas to cut out that you will need to drill a hole. One of the issues I found was that sometimes you may not have a really nice spot to drill the hole. On the extreme of this, you may find that you need to drill a small hole on a thin line as there is no nice open area for the drill hole. What I did to help me out on this was to get the smallest scroll saw blade I had along with a small drill bit that I could thread the scroll saw blade through. One thing I did note in some of my projects is if I didn’t get my drill hole small enough, I could visibly see the remnants of a drill hole along the line I just cut. This of course I found I could smooth out by making the line a little thicker if needed. An additional thing to note with having to cut from drill holes, is the repetitive steps of; reducing tension on your scroll saw blade, freeing the top portion of the blade, feeding the scroll saw blade into the drill hole, re-affixing the top of the scroll saw blade, and then finally tightening the tension back on the scroll saw blade. Though with some practice, I was able to get the process down smoothly to where it was not time consuming and taking away from my time cutting. There are a lot of smaller pattern scroll saw projects out there. 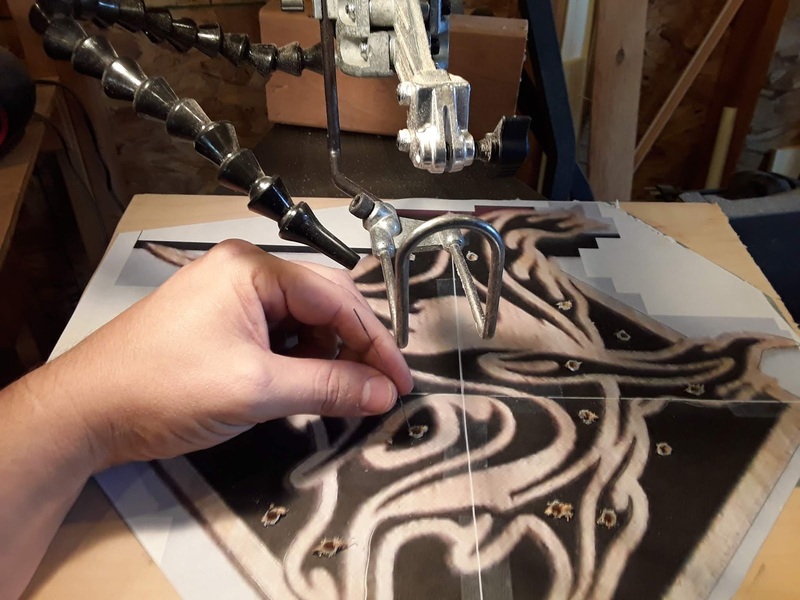 If you find yourself wanting to work on a small scroll pattern you will need to consider the ability to move your pattern around in the cutting area of the scroll saw. I found that if you don’t have some extra space, (excess wood), around your pattern to hold onto, you can get dangerously close to the blade. You can also find it very difficult to hang onto your pattern. My fingers can get fairly tired, sometimes feeling like they are cramping after holding a pattern for a long amount of time. I really do not like the thought of having my fingers close to the scroll saw blade when my fingers are fatigued. Though one may not remove a finger as easily with a scroll saw as you would with a larger cutting tool, I do always try to keep in mind the respect I should have for any of the power tools I’m using. A trick I have learned from some online research is to clamp on some excess wood to the sides of the project if it is a fairly small project. This may depend on wood thickness of your project, too thin a wood for the project and this technique may not work. 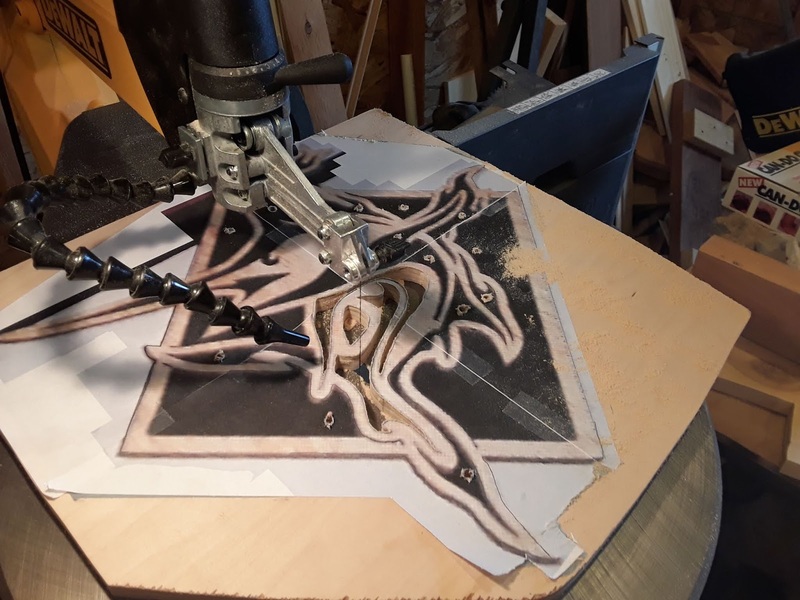 Being able to use this method would give you the ability to now handle the clamped on wood to help you move your project through the scroll saw, you could also hold onto the clamp itself. Some really great clamps that I have worked with in many wood working projects, not to mention around the house, are the IRWINQUICK 6″ and the IRWINQUICK 12″. 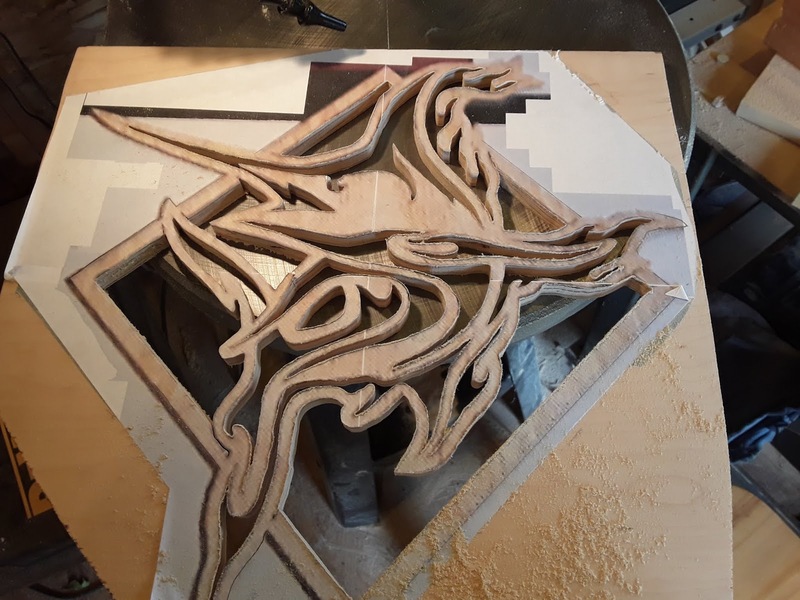 I am not sure if it is just my thinking, or if there is some sort of general rule out there, but I made a process for myself when it comes to planning my cuts on a scroll saw pattern. Firstly, I drill any holes in the pattern for those cuts that need them. Then I tend to cut anything in the center of the pattern, continuing to make cuts progressively toward the outside of the pattern. On my last cut, I try to make it the one that separates the pattern from the excess wood I am hanging onto. On some projects this flow does not always happen in such a precise order. I have had a project or two where I cut from right to left or left to right. Those projects were primarily Intarsia wood art projects where I was cutting out piece by piece. Those Intarsia projects still required some planning on my cuts as I had to be careful of the wood jumping with the scroll saw blade. The jumping occurs when you don’t have a good way to hold down the pattern securely as you cut. Which seemed to happen to me when I could not hold down the pattern on one of the sides. I do note that some scroll saws, if not most, have a support arm that can help you keep your pattern from jumping. This arm may also help with preventing your fingers from getting too close to the blade. Though at times I admit this bar is kind of in the way, and I remove it on several projects. I am sure there may be some different variations of how to plan your cuts when it comes to your scroll saw patterns. This is what I have found to be most helpful for me. Remember, if you get too much wood jumping on your project, check your blade is not in upside down. Teeth facing down is the correct way. It seems the cut out scroll saw patterns are not always perfect when you are done cutting. It can be a little scary to start sanding a side of that fragile piece of art you just created. In fact, I have broken a piece on a project or two after having applied some sand paper, it does happen. Often I cannot even get sandpaper into any of the smaller nooks and crevices of the project after I am done. Working out some of those rough spots for me has been a bit tricky but I have found a few things I can do. I tend to try and hand sand out any spots I can actually get some good sand paper into. I have a precision Dremel tool, these can be with cord or cordless, that I can attach sand paper and even some rough bits on there to help get in those hard to get places. Wen looks like they make a pretty good tool for much cheaper as well. I have even used the scroll saw itself to work out some rough edges in tight to get to spots. Using the scroll saw in this manner can be a bit tricky as you might start to make smoothing out cuts you did not really plan on. There are likely many other ways to accomplish this. To each his/her own. Are you Looking for Some Starter Patterns? It may be hard to find a pattern to start in scrolling out your first projects. Some people may not be able to do what I do and may have to purchase some good patterns. I admit, someday I might buy a pattern or two, its feasible, I like a lot of what I see out there. There can be some good cheaper resources out there for patterns such as Wildlife, general scroll work, or even what I am really excited about Intarsia.